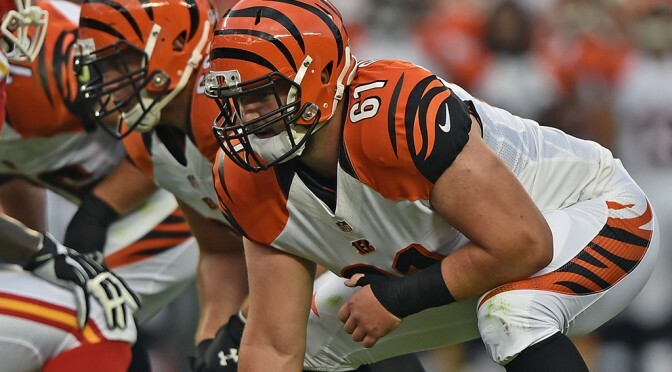 CINCINNATI -- It was Russell Bodine's knack for physicality that impressed Cincinnati Bengals coaches during the pre-draft process last winter and spring. Film of his blocking ability in college at North Carolina, along with his impressive strength (he led all players at last year's combine with 42 bench reps) impressed the Bengals. When they made him a fourth-round pick in May, they envisioned having him for games like Monday night's. Although they are facing the No. 2 rushing defense in the league, it's clear the Bengals still would like to run the football when the Denver Broncos come to town for ESPN's "Monday Night Football" 2014 finale. Any success they have could hinge on Bodine and how physically he plays against one of the league's toughest and largest defensive tackle matchups. "Terrance Knighton is 'Man Mountain Dean,'" Bengals offensive coordinator Hue Jackson said, comparing the Broncos' 330-pound interior lineman to a famed 1930s wrestler of similar size. Knighton may not get the widespread praise from national media that pass-rushing tackles like Geno Atkins receive, but that doesn't mean he isn't respected by his peers. Bengals rookie running back Jeremy Hill wants to avoid tangling with Knighton as much as possible. That's why he believes the Bengals' rushing success will fall on Bodine's shoulders. "The run game is going to [predicate] on how he blocks Knighton," Hill said. "If he can get him blocked up and we can get everybody else on to the second level, up on their linebackers, there are some holes to be had in there. But if [Knighton] is having a game, you're not going to get any rushing yards." Part of the issue is that Knighton's massive size and strength makes running backs avoid going directly up the middle if they can help it. They'd rather find holes along the outer edge. But the problem with doing that against Denver is that the Broncos' outside linebackers and defensive ends, long lauded for their pass-rush ability, are pretty good against the run, too. When those edge defenders can seal off the outside, a running back gets forced back into the inside. That's when Knighton is there to swallow him up. "People look at these guys as pass rushers, but they're also very disruptive in the run game with their athleticism and ability," Bengals head coach Marvin Lewis said. "They're going to make you earn things." So, why is all of this important? And why is Bodine the lineman worth focusing on? Because it has been behind him that the Bengals' rushing offense has primarily operated. Of the 1,824 rushing yards the Bengals have, 72.4 percent have come between the tackles. A separate 27.5 percent have gone specifically behind Bodine. The interior run has, quite simply, been a hallmark of Cincinnati's ground game. All season the Bengals feel good about Bodine, and this week they are confident he's up to the task of beating back Knighton. "He's what we hoped he would be: a really, really tough, physical guy that's going to do nothing but grow and continue to get better and be like the top centers in the league, we hope -- the [Eric] Woodses and Alex Macks, and these guys who have excelled," Lewis said. "They're big guys, physical guys. You like to be around that, and that's what you want in the center of your football team."